I was in such a hurry I posted it in Off the Beaten Track. So it goes. Didn't see that you had posted it there, Z. My colleague in Canada asked the question: Is it a terrorist act? No idea. The explosions were small and well after the fire started. The link I posted said that French police were treating it as an accident so far. Who knows though at this time. If this was here, there'd be three aerial streams on it by now. ??????????? Well, even though it is famous since it isn't here, it isn't really important. after all Donnie might say something stupid on Twitter. We can't devote time to both things. Fire flashed over, and is spreading fast. MSNBC is more interested in something to do with the White House. As you can see from the scaffolding, they were working on it. Somebody goofed? Iirc, there is a lot of wood in the framing of the roof of structures like that. They obviously aren't just masonry. As for goofing if they were working with solvents or solvented paints that could be a contributing factor. just heard the fires began on the roof?.? anyone else? 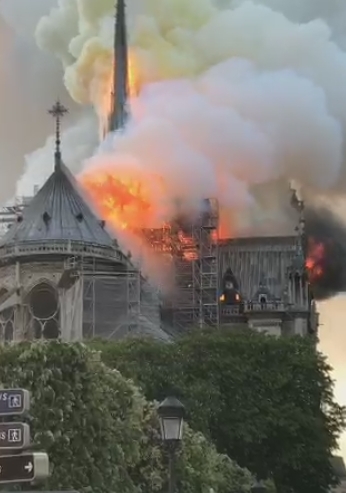 French Police believe the fire started around the scaffolding. I visited Paris in the mid-80s and saw Nortre Dame Cathedral. I didn't tour the inside but saw the entrance closeup and the outside from various locations. Among the features were the flying buttresses which were added as the cathedral grew in height causing the walls to push outward. The flying buttress supported the roof, not the walls, relieving pressure exerted by the roof on the walls. Just saw a WaPo piece that Donnie tweeted that maybe firefighting aircraft could be used “must move quickly!”. Same piece noted that the central spire had collapsed. 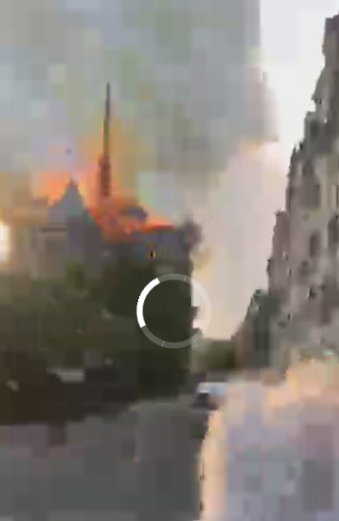 Reports now that the fire has collapsed and the interior of Norte Dame is burning as well. It's gone. Everything but the walls. Why would Paris need an air tanker? I don't intend to dignify that by wasting any more of my time on it. As it was, they did get aerial streams on it, finally, but they had no effect. There was no way to fight this fire once it got established. Fire fighters did go inside what was by then essentially a giant bonfire, to rescue anything they could, and you could also see them walking around inside a burning tower. Bravest of the brave, indeed. Regardless of what you think of the Catholic Church, it's tough to see heritage destroyed like that. BBC banner saying main structure 'saved and preserved'. 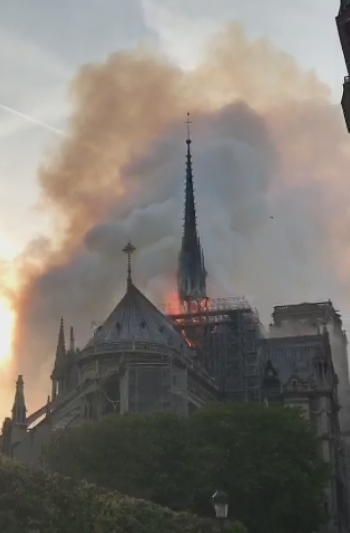 900-Years of French History up in smoke. Paris Officials are now saying that they cannot guarantee that Norte Dame De Paris can be saved. Norte Dame survived the French Revolution and the Nazi Occupation. The interior was stunning. All that History gone. MSNBC reporting that while the spire has collapsed, the two towers and most of the main structure survived. It will take time to assess the damage to the structure which will be substantial. The cause remains unknown, though restoration was in progress and it could have been some type of accident. No one was killed or injured (or at least is known so far). Fires are still smoldering into the night time. BTW: it's fascinating this happened at the same time, and please note I'm not saying it wasn't coincidence, but also note how little coverage it got versus the other story, a fire broke out near the al-Aqsa mosque in Jerusalem. BTW though: the fire seems to have started in a nearby prayer room (Marwani) and not done much damage to the main structure, and appears to be out at this point. Cause also unknown, though the Waqf is suggesting it may have been started by some careless children. BTW, aerial bombardment of the structure from large aerial water tankers probably would have made the whole building collapse. Great for fighting forest fires, silly for fighting very old building fires. Once again, our idiot in chief offers useless advice. The loss of history is very sad. If the facade has actually been saved and can be used for rebuilding that would be good. It was a beautiful structure. Macron has said Notre Dame will be rebuilt. France owns the building so they'll probably use taxpayer monies and setup a fund site to accept donations. I'm wondering how much it will cost to rebuild. I'm guessing somewhere in the $500 million to $1 billion range. Stuff is not history. History has not been harmed. Things like this are good for an economy. It taps into stagnate church funds and gets it back out in circulation. It creates years of work for many thousands of craftspeople. In this case it will keep alive some craft arts which have been dying out. Some craft houses might get to be passed on to another generation.